ST. LOUIS (Jan. 14, 2008) Ã¢â‚¬â€œ As one of the hottest new products to hit markets in California and Texas cities, followed by tremendous success in Arizona, Colorado and Nebraska, Budweiser & Clamato Chelada and Bud Light & Clamato Chelada will arrive in convenience stores, supermarkets and grocery stores nationwide today. Latinos, specifically those of Mexican descent, have been mixing beer with Clamato for decades. Budweiser & Clamato Chelada and Bud Light & Clamato Chelada honor that tradition by combining Anheuser-BuschÃ¢â‚¬â„¢s classic American-style lagers with the spicy, invigorating taste of Clamato Tomato Cocktail, made by Cadbury Schweppes Americas Beverages (CSAB). A savory beer, Budweiser & Clamato Chelada and Bud Light & Clamato Chelada were developed with the adult consumer in mind. Budweiser, a classic American-style lager, and Bud Light, a classic American-style light lager, are the worldÃ¢â‚¬â„¢s best-selling beers, and Hispanics have been enjoying the great taste of Clamato since its introduction in 1969. 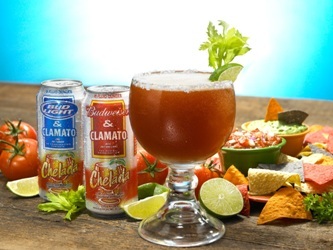 An estimated 60 percent of all Clamato is purchased with the intention of using it as a mixer, so the combination of the three brands means the adult consumer can more easily enjoy a recipe they already love. To best enjoy Budweiser & Clamato Chelada and Bud Light & Clamato Chelada, gently rotate the chilled can once before pouring. Then, serve cold, or pour over ice, into a traditional goblet-style glass and garnish with a slice of lime or celery stalk. Salting the rim of the glass or adding a dash of hot sauce to the beer allows adults to further customize Chelada. The beers also pair well with traditional Latino dishes such as ceviche, chicken enchiladas and tamales. The launch of Budweiser & Clamato Chelada and Bud Light & Clamato Chelada marks the first time Anheuser-Busch and CSAB have worked together. The agreement between the two companies specifies that CSAB will supply Clamato to Anheuser-Busch for use in mixing the Budweiser and Bud Light Chelada, and that Anheuser Busch will produce, package and distribute the beers through its network of wholesalers. The name Chelada is a shortened form of the Spanish word michelada which loosely translates to Ã¢â‚¬Ëœmy cold beer.Ã¢â‚¬â„¢ To order Budweiser or Bud Light & Clamato Chelada, one might say: Ã¢â‚¬Å“Una michelada con clamato, por favor.Ã¢â‚¬Â To shorten that but still keep the beer recognizable as the traditional recipe, Anheuser-Busch focused on the name Chelada. Brewed at Anheuser-BuschÃ¢â‚¬â„¢s St. Louis brewery, Budweiser Chelada contains 5 percent alcohol by volume (ABV) and Bud Light Chelada contains 4.2 percent ABV and is available in 24-ounce single-serve cans and 16-ounce, four-pack cans. Based in St. Louis, Anheuser Busch is the leading American brewer, holding a 48.4 percent share of U.S. beer sales. The company brews the worldÃ¢â‚¬â„¢s largest-selling beers, Budweiser and Bud Light. Anheuser Busch also owns a 50 percent share in Grupo Modelo, MexicoÃ¢â‚¬â„¢s leading brewer, and a 27 percent share in China brewer Tsingtao, whose namesake beer brand is the countryÃ¢â‚¬â„¢s best-selling premium beer. Anheuser-Busch ranked No. 1 among beverage companies in FORTUNE MagazineÃ¢â‚¬â„¢s Most Admired U.S. and Global Companies lists in 2007. Anheuser Busch is one of the largest theme park operators in the United States, is a major manufacturer of aluminum cans and one of the worldÃ¢â‚¬â„¢s largest recyclers of aluminum cans. For more information, visit www.anheuser-busch.com. 90 Comments on "BUDWEISER & CLAMATO CHELADA AND BUD LIGHT & CLAMATO CHELADA ARRIVE NATIONWIDE"
is cheleda in Oregon yet? It’s certainly being distributed there. You’ll have to check with your local store to see if they have it on the shelves. If they carry Anheuser-Busch products then it should be available through their distributor. If they don’t happen to have in stock they can get it for you. I have some in my ‘fridge, you’re welcome to have it… I managed to hold off the gag reflex for the first few sips, but not much longer than that. Seriously bad news, at least for my tastes. My first thought when I tried it was, “Well, I wouldn’t want to drink to much of it but it might be interesting to cook with.” Maybe you could whip up a batch of manhattan clam chowder with it. I love this stuff… I’ve been a Bloody Mary drinker for years and now with the Bud Chelada, I can enjoy similar ‘hearty’ drinking in a beer! This stuff is awesome! I thought nothing got better than an ice cold Budweiser on a hot day! But then….one day I saw Chelada! Being alover of clamato juice, I thought WOW! I tried it and I LOVE it! I hope it stays and not just as a trial thing. If you love beer and tomatoe juice this is the GREATEST!! Hey Bryce, Good idea with the recipe. I did it with chili this afternoon. It turned out awesome! This drink is fabulous! Very very tasty…I’ve been a Budweiser drinker for over 20 years and I’m also a Bloody Mary Drinker and this has topped any Bloody Mary I have ever made…it already has a little carbonation and I add a dash of Tabasco and my my my,..very tasty indeed…Good Job Budweiser! i tried it today and it definitely needs lime. I wish it came in 12 oz. 24 oz is a little too much. The ‘juice and beer” thing was popular in Pennsylvania back in the 40s and 50s. Every bar had small tomato juice and grapefruit juice behind the bar. I liked the tomato but the grapefruit turned me off. Okay….I’ve been dying to try this and FINALLY succommbed to the urge. I wasn’t sure about this combination, even though it’s been around for years. I am a lover of V-8, Bloddy Mary’s and, of course, Bud Light. The first few sips were a little odd but it did grow on me. I then decided to “spice” it up a bit and I actually like it! I rimmed a glass with lime and seasoned salt, added a few dashes worcestershire and tabasco. Very yummy! we just came back vegas and had the chelada out there…. WE LOVED IT! IS it available in Orlando area yet? I have spent over an hour tryin to find something that has store locators. It’s available nationwide. If your beer store doesn’t happen to have it on the shelf they can certainly get it for you. As far as I know it’s being distributed nationwide – at least that’s what the press release says. If your local beer store doesn’t have it in stock and on the shelves they can get some in for you in a matter of a few days. drinkin on one now, im not usually a drinker & this stuff has a kick to it. its growing on me, i kinda like it, i guess? Hey guys this is great. went to bush gardens virgina today.. and had it for the first time.. HEHE… also was interduced to wild blue another very good beer.. keep this up we love it.. I think it’s one of those things you either hate or love. I loved it. I am not at ALL a beer drinker and I’m not even sure why I tried the stuff but I LOVE IT!!!!!! I am not a beer drinker, but this stuff is great! This is a great product! I’ve been mixing bud and V-8 for years now it’s done for me. Now all they need to do is hook up with Tabasco sauce and make a spicy version. I don’t speak spanish, and not ready to now. How-ever! your Bud-light Clamato makes me say wow. Muy Bien, excellant taste, very nice, don’t need to add a thing. Excellante job Budweiser. I love beer. I also love tomatoes. This is horrible stuff. Bud needs to stick with making a good pilsner and not cocktails. Not a beer drinker but this is great….hard to find in Illinois. Anyone know where I can buy the 12 ounce cans in the Portland Oregon area. I found them in Idahoi, but not here in Portland. These Chelada’s are fantastic! Just the right amount of everything in the mix.It would be nice if they came in 12 and 16 ounce cans, and maybe a version with a little more lime and a little less Tabasco, but hey, why complain when one can just add a little more lime himself? Good stuff! I love the Chelada but after 2-3.. i get drunk where i can not remember the next day… is it different alcohol content than a Budlite? and.. i do not have a hangover ???? Hmm interesting, Donna. According to the Bud Chelada fact sheet Budweiser & Clamato Chelada is 5 percent alcohol by volume (ABV) and Bud Light & Clamato Chelada is 4.2 percent ABV. That’s pretty standard for beer so I’m not sure why this particular brew has such an effect on you. If you like Bloody Marys and Bud Light. You will love this new drink. Just try it and you will love it as well! It is a great tasting beer. I find that late in the summer evenings I enjoy sitting outdoors drinking this beer. At first I did not understand why I like the taste until I understood it has clam juice. Its good, but we in the midwest have been doing this for years…..hell I thought Nebraska was home of the red beer. All joking aside though, this one hits the spot on those slow sunday afternoons. The salt (NaCl) concentration in a can of regular beer is about ~ 9 mg per serving (not very much). The salt (NaCl) concentration in a can of Chelada is about ~ 1900 mg / serving ( that’s a lot more than 9). US labeling requirements does not require brewers and bottlers to list the amount of salt used in their products. I think Chelada is a great tasting product and since I don’t have any salt restriction or special dietary concerns, I drink it occasionally. But consumers should know that the amount of salt in a serving of Chelada is a lot more than regular beer. I bought this bud light & Clamato in the upper penesula a few weeks ago but haven’t been able to find it in my area of Northwest Indiana or in the Joliet IL area. Can you tell me where to find it? Any idea where to find this in Maryland/DC/Virginia? iI bought this Chelada at Costco in Central California some time back my husband loves it but I can’t seem to find this by the case anywhere and Costco does’nt seem to carry this anymore. Can you tell me where I can purchase this by the case? I did not ever need to know that something this horrifying existed. Writing up this comment as I just bought a Bud Light Clamato from Safeway this evening. As one of the reviewer said, I am trying to overcome by initial reflex gags. Firstly, this beer tastes very salty, something I did not expect in a beer. Secondly after a few gulps, I have my palette and guts buring with the spiciness of this beer. I am just trashing this and switching to regular beer. Ooohh….I hate this…Anheuser-Busch should just make good regular beers and leave customization to people who can do it after market. What grocery chains or liquor stores carry it in our area? My wife tried in Louisiana and loved it…I’m not a beer drinker, but I want her to be happy. I’m telling everybody that Chelada is for the birds. That way I can tweet all the way to the liquor store and have it all to myself. i love the beverage but here in eastern ky. anheiser bush makes only one pallet of it a month. that b/s i have introduced others to it and they like it as good as i do so its a rat race to get it anheiser bush needs to make more for this region so i wouldn’t have to chase the budweiser truck from store to store so i can stock up on it!!!!!!! Hi, I just tried my first Chelada and of course LOVE it!!! However I live in Canada….is there any chance this will be crossing the border anytime soon?? Everyone I tell about this beer can’t stop thanking me. My father in law loves to have one before bed. Thanks for impressing the in laws. Please let me know where I can get bulk. love the taste of this beer do not stop making it. I’ve been drinking Clamato juice in my Bloddy Mary’s for some time now and love it over the traditional tomato juice types that are thicker. When I saw the Chilada in the store I had to try it. I wasn’t dissapointed. One suggestion to those considering trying it, pour it in a cold glass and don’t drink it from the can. There’s a major taste difference. Good job Bud… I usually don’t even drink your brand of beer but I will now that you have the Chilada! I have been mixing clamato juice and beer for years. In Virginia where I have lived all of my life, we mix tomato juice and beer and call it red eyes. That is what you ask for when going to a bar. we put salt and pepper on top of it. I started making beer and clamato juice about 25 years ago and my friends and I started calling them clam eyes. they are awesome. They are also awesome for hangovers. It is the best mix I can drink, and it is great to make bloody marys!! and people wonder how bush got elected……. This stuff is great. Thumbs up. I am THOROUGHLY enjoying this beer flavor! You see, after I have a few brewskis, I tend to get hungry. That leads to foolish consumption of leftovers, snacks, etc. Yet, if I make one of these beers my last drink of the night, my hunger is satisfied. I tried one from a gas station about 2 years ago, and have not drunk anything else since. I LOVE red beers! I drink about 4 a day, and havn’t had a cold in two years! I’ve been without at certain times, and a reguar beer just tastes like piss to me now! I wish wish wish that it came in a normal 12 pack, like it should. Everything else does! I haven’t tried this Chelada but since I am Spanish , I am going to get a can today. Where should I go to get it. I went to a store last week and I didn’t see it. Do I need to ask for it??? I LOVE IT!!!! But I cant find it Daytona!!!! It cures a hangover and if you wanta go drinking but cant get”started” cuz you know the beer wont sit right, one of these does the trick! LOOOOVE it! In 30 years I never developed a taste for beer. Then a co-worker ( who is from Mexico) was telling me about Micheladas…..wow it sounded sooo good. The next day I was in Winn-Dixie and saw the Bud-Lite can that said “CHELADA” I WAS SO EXCITED. I bought it, came straight home and popped open the lid…um it was a little filling or heavy to me, so now i mix mine with my husbands BUD LIGHT LIME AND I LOVE IT. THIS IS MY NEW DRINK!!! I normally don’t crave beer but I find myself craving the Bud Light & Clamato Chelada, especially on the weekends when I can relax and pop open a cold can. I like both the Budweiser and Bud Light versions but Bud Light goes down a little smoother in my opinion. Haha, my roommate isn’t too big on them but I think they are pretty refreshing, especially for someone that loves tomatoes and the bloody mary. Way to go AB! this beer is disgusting…..only because Im not a clam juice fan. If you like Clam Juice plus Tomatoes with your beer then I’m sure this will be a hit. I think it’s a great hangover drink!!! I love it! Where in FL can I purchase Bud Light & Clamato Chelada ???? I had some in MI this past summer and really developed a taste for it. Living in FL, I can’t find it here. Please help me. We are from Canada but also have a home in Palm Springs, CA. I was wondering where we can get these awesome budweiser chiladas in Canada?? I tried the budwieser Chelada this past weekend while in the US. Love the stuff but I live in Canada and I am 3 hours from the border and they don’t sell it at duty free. Does any one know if there is a way I can get it up here? I can only bring back a case if I stay in the US for 48 hours but that case wouldn’t last me a weekend, and of course it’s not real convenient to drive 6 hours for one case! I can make it but really if it’s all ready in cans why bother!!!! Im Mexican, and we ahve been mixing Clamato and beer for decades. (That’s a traditional drink called Chavela). I recently had a bud light Chelada and let me tell you!!! its just PERFECT! IT MAKES ME SO HAPPY!!!! Greatest beer I have ever tasted. Down her in south Texas I buy them in 24 oz cans. Kinda expensive. Looking at making my own. They sure are good. You go AB. Is it possible to buy Budweiser Chelada beer in Canada? Do they sell this in PA? I was recently in Mexico and abousolutely love this combo. Wish i could find it locally. They only sell Clamato in little bottles and it is a little pricey. Totally a disappointment to the mexican community nothing like the stuff they make in Mexico its just beer a tomatoe juice it has no other condiments like the original michelada….this is Flavorless! Discontinued in Buffalo…..need to find Bud Chelada!!! Where? How???? I love this stuff! I am not a beer drinker and I enjoy these. The taste is awesome. I love Clamato and mixing with beer makes for a great refreshing taste treat. HOWEVER – anyone who use ANY Budweiser product is an ignorant idiot or a scumbag. These putrid worms are one of the nation’s most virulant supporters of homosexual;perversions and pedophiles – and I mean BIGTIME!. Just Google it and see what Christian mocking scum these people REALLY ARE! If you are a decent person – pass this around. i love this stuff will it come in 12′s and 24′s i get the 4 pack and the duce but i want more please give me more this is the best!!!!!!! I discovered this tonight at my local Mexican Market (Jons). I found it overpriced, but I love it! Will it ever come to the Los Angeles area where you can purchase it in twenty four, twelve packs or six packs as opposed to individual cans??? I’d gladly like to see it in all markets I shop. Where in Canada can we buy Cheladas. They are soooo yummy!! I love it, wish they would sell it by the keg!!!! !